Tesla Motors is at the forefront of the electric car revolution, but a controversial review by the NY Times has created quite a bit of turbulence around the brand over the past couple of weeks. Basically, NY Times reviewer John Broder took the Tesla Model S sedan for a test drive to try out Tesla’s new “Supercharging stations,” meant to make electric car travel a more viable option, but ended up having to call for a tow after his car ran out of power. Musk is no stranger to combating reviews that he believes to be untruthful. In fact, his “Top Gear BS” comment above refers to a dustup over a negative review that’s resulted in Tesla filing two lawsuits against the show. 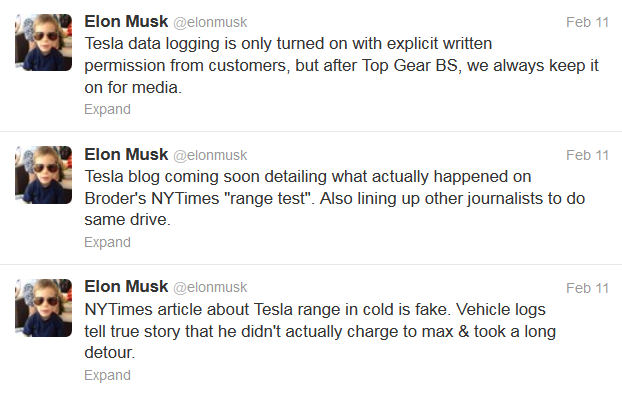 Tesla’s crisis management offensive included encouraging Tesla vehicle owners to recreate the Times review route, reaching out to other journalists to repeat the drive and, unlike many disputes we see, actually backing up his statements with cold, hard data pulled from the Model S’s “black box” detailing every second of the drive. While the Times did attempt to refute, point by point, Tesla’s claims, the fact is that data from the black box directly contradicts several statements in Broder’s original review, throwing an enormous cloud of doubt on any statements from the Times camp. Was this a clear-cut victory for Tesla? Not entirely, those that didn’t follow the entire saga, and even some that did, may still come away doubting the company. Did its high-risk, hardball strategy end up generating a heck of a lot of publicity for its brand, as well as defending its reputation and public perceptions of electric vehicles, which is critical to the Tesla’s success? Absolutely. Brassy crisis management Tesla, well played.